Flann O’Brien is the best-known pen-name of the Irish writer Brian O’Nolan (1911-1966), who as well as five novels as O’Brien also published millions of words as a surreal and satirical newspaper columnist for the Irish Times. Study of his work had been sporadic until the present decade, despite some significant events (such as conferences in Dublin in 1986 and 2006 respectively marking 20 and 40 years since his death) and critical works. In 2011, the situation was taken in hand by three O’Brien enthusiasts – Paul Fagan, Ruben Borg and Werner Huber – who held a major centenary conference in Vienna and officially launched the International Flann O’Brien Society complete with website, inclusive bibliography and peer-reviewed electronic journal. The conference has remained biannual since, visiting Rome and Prague, and substantial volumes of critical essays have arisen from these events. In 2017 the symposium landed in Salzburg at the edge of the Alps. 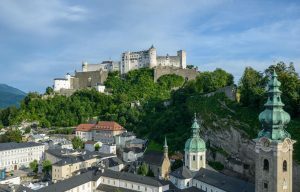 The city’s castle, the Festung Hohensalzburg, looked down over the conference location in the modern block of the Unipark building, whose cavernous cool spaces offered shelter from the sunshine that blazed continuously on the nearby streets and squares of the Old Town, crammed with tourists and occasional Flanneurs. The sun only broke for a couple of sudden, immense thunderstorms which happened to coincide with conference outings to readings at different locations. The conference programme included around 50 papers, plus a host of additional activities and sessions including readings, theatre, a film screening and an art exhibition. In this context I was quite surprised, near the end of the week, when a delegate reported that some in Ireland were saying that the Flann O’Brien bubble would surely soon burst, and that this particular critical industry could not sustain itself much longer. Such single-author enterprises are perhaps always at risk, and one can understand the bemusement of some on seeing O’Brien receive attention as sustained as that typically awarded more solidly canonical writers. Yet the predictions of detumescence seemed to me belied by the evidence of the conference, in a few significant ways. Most notably, Flann O’Brien studies is increasingly founded on a textual archive, which is growing in size (as more material is discovered) and increasing the sense of solidity of the whole critical enterprise. Numerous delegates here casually referred to letters by the author that they had seen but are not yet in the public domain: this already showed a shift from the situation in 2011, but the larger shift is yet to come, with the Letters of Flann O’Brien projected for publication in late 2018. Many of us have talked of the desirability of such a venture in the past, but it is now becoming a reality thanks to the archival and editorial labours of the scholar Maebh Long. Long gave the opening keynote address, and on this occasion the metaphor of ‘keynote’ had some pertinence, as her talk resonated, set a standard and was constantly referred to through the week. Long’s theme was a grey area where collaboration and plagiarism meet. Evidence from unpublished letters showed Brian O’Nolan in dispute with his long-standing friend Niall Montgomery as both, at different times, accused each other of stealing the other’s work for newspaper publication. But more remarkably, Long had also discovered a story by another friend, Niall Sheridan, which seemed uncannily close to elements of the Flann O’Brien masterpiece The Third Policeman, written at the same time. Had this singular novel been influenced by Sheridan, or vice versa? Had the likeness arisen from a deliberate joint decision to publish related stories based on a similar idea? Long could not say, but her unearthing of this work was revelatory. Later in the week, Christian Dupont, head of the archives at Boston College, introduced the conference to his library’s extensive holdings on Flann O’Brien (such as typescripts of novels and plays, and books with the author’s marginalia), with reference to other collections of manuscripts held elsewhere. Dupont’s engaging presentation emphasized the way that a textual archive underpins the future of Flann O’Brien studies. At the same time, in a closing round table, Maebh Long sagely cautioned that the publication of the author’s letters should not be used to close down debate and reduce all interpretation to biography. The newspaper column Cruiskeen Lawn has always been the least fully tapped primary resource of Flann O’Brien studies, a textual seam from which superb material has already been mined but which could continue to reward much digging. The increasingly well-organized efforts at this provide a second indication of the longevity of this field. The scholar Catherine Flynn, absent from this year’s conference, has been working on a new edited collection of key columns from the Second World War. Some strong papers at the conference looked closely at the column. Perhaps the outstanding case was Catherine Ahearn’s synoptic view of the column’s quarter-century, with detailed figures about the numbers of columns per year, the length of the author’s absences from the newspaper and so on. Once again, a sophisticated interpretive attitude was founded on empirical data to a degree not hitherto seen in the field. A third area is the expansion of the potential canon or corpus of this author, aside from the column. The conference theme, ‘Acting Out’, seemed to invite a reconsideration of his plays (mainly produced in one period, around 1943), but apart from a panel on the first day, few delegates took this up. A large number of papers continued to centre on the pair of novels he wrote first, At Swim-Two-Birds and The Third Policeman. It’s understandable that such brilliant works continue to receive such attention, but there still seems to be space for a more sustained consideration of the other novels, plays and short stories. Lastly, through discussion with other delegates, I gained a sense that what would prolong Flann O’Brien studies further is a fuller engagement with history. Not so much in the broad strokes of, say, nationalism and revisionism, important though they are, but in more close-grained attention to specific moments, places and institutions. While much of this has already been adumbrated, it is salutary to consider how much one has still to learn about, for instance, diverse sections of the Irish press in the 1930s and 1940s, or the civil service in which the author also worked. I have long attended a seminar on James Joyce’s Ulysses in which, as we read the text one line at a time, a passing reference to a particular newspaper title can provoke a 20-minute discussion of that organ’s history since the 19th century. Something comparable could happen with Flann O’Brien, and one result would be a tilting of attention from text to contexts, where a passage in a novel, for instance, would become a way in to a much longer detour through institutional histories. The next symposium will be held in Dublin, which seems to invite such a granular and localized approach: why not, for instance, try to hold an entire panel on the significance of Brian O’Nolan’s celebrated editor at the Irish Times, R.M. Smyllie, or a paper on his civil service manager John Garvin, who was also the author of one of the first Irish analyses of Finnegans Wake? Such sideways moves into other contexts need not only be Irish in focus: at this conference, an excellent example was Joseph LaBine’s excavation of O’Nolan’s friendship with the American author William Saroyan, which has always loomed intriguingly in the biography but has never been this fully explicated till now. Beyond all these critical concerns, the symposium had another distinction, in hosting work that could readily be called ‘creative’. Arthur Riordan, author of the terrific stage musical Improbable Frequency, delivered a new monologue in which Flann O’Brien exchanged irascible letters with Bertolt Brecht. Alan Titley unearthed an old monologue, largely a collage of quotations from the author, which provided a sensitive and shrewd version of his life. In a small Salzburg theatre Val O’Donnell reprised his one-man show offering another version. And there was much more where that came from. The consistently high quality of this ‘cultural fringe’ surprised me, and reflected well on the organizers’ attention to detail. The evidence that Flann O’Brien can still inspire artists of various kinds seems another sign that the conversation about his work has a way to run before, as proposed in At Swim-Two-Birds, reaching three or for that matter one hundred times as many endings.